There seems to be some confusion around the Basle banking regulation with respect to sovereign debt. We want to take a quick look at two distinct concepts here: "risk weights" used to determine capital ratios and "liquidity ratio" used to make sure banks have sufficient short-term liquidity. 1. 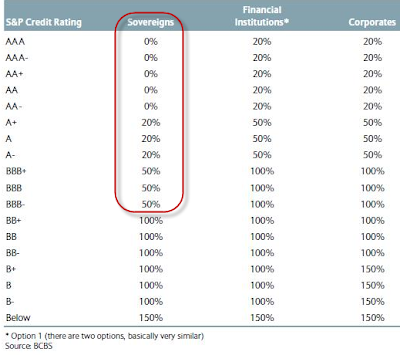 First let's take a quick look at risk weights for sovereign holdings. The matrix below outlines what the risk weights currently are for sovereigns, financials, and corporates based on what's called the "standard model" for risk weights. Some institutions apply "internal ratings" using models that have been approved by their national bank supervisor, but for discussion purposes, let's focus on the standard model. The rule of thumb is that you take the "risk weight" shown above and multiply it by 8% (assuming you want at least an 8% capital ratio) to determine how much capital you need against this asset (that is how much leverage is allowed). The problem with European banks is that it was easy for them to accumulate a great deal of sovereign debt because in most cases there was no capital charge at all. The lower rated paper would require 2%-4% capital vs. an equivalent rating corporate loan for example that would require the full 8%. That is why there is so much focus on sovereign downgrades as lowered ratings automatically increase risk assets of these banks without them even buying anything. And as paper moves into "junk" category the capital requirement increases could be quite sharp. Therefore Basle-III may adjust this matrix to make sure there is always some capital held against sovereign debt. The transition process however will be painful. The liquidity measures are split into two: the liquidity coverage ratio (LCR) and net stable funding ratio (NSFR). The former is designed to ensure banks have enough high-quality, liquid assets to survive a 30-day period of acute stress, while the NSFR is meant to eliminate funding mismatches by establishing a minimum acceptable amount of stable funding based on the liquidity characteristics of a firm’s assets and activities over a one-year horizon. This latter ratio is some distance away from being ready for implementation, some market participants claim. LCR is already regulated and measured, but the full requirement isn't going into effect until 2015. To maintain sufficient short-term liquidity, banks would be required to hold a certain amount of "liquid" assets. Businessweek: Basel’s so-called liquidity coverage ratio, scheduled to be phased in starting in 2015, requires banks to hold enough “high-quality liquid assets” -- predominantly cash and government debt -- to survive 30 days of stress. Only a quarter of 28 of Europe’s largest banks would comply today, leaving a shortfall of 500 billion euros ($670 billion), according to a Nov. 29 report by Kian Abouhossein, an analyst at JPMorgan Chase & Co. in London. CentralBanking.com (15 Jun 2011): The French prudential regulator, Autorité de Contrôle Prudentiel (ACP), appears to be at odds with the Basel Committee on Banking Supervision over whether equity should be included in the liquidity coverage ratio (LCR). In an interview with Risk, Danièle Nouy, secretary-general of the ACP, expresses concern that the list of eligible assets under the LCR is too narrow and should be broadened. The LCR, finalised by the Basel Committee last December, requires banks to hold enough liquid assets to survive a 30-day period of acute stress – and stipulates that a majority of the buffer should comprise cash and government bonds. This is certainly going to generate debate. Ultimately both the capital ratio and the liquidity ratio frameworks will have an impact on sovereign debt quality and volumes held and traded by financial institutions.